An Elegant City Venue, But Does The Food Live Up To It..? 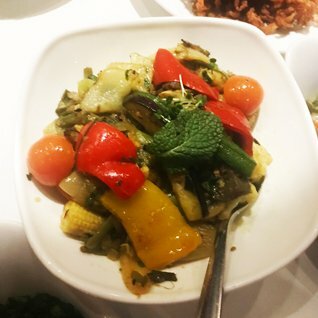 From a quick glance at Google Maps, Anokha has a problem – there’s another restaurant called Anokha nearby (nearer to St Paul’s), which seems to have attracted quite a few negative reviews. Well, Google reviews aren’t everything, and the latest press release for this Anokha looked promising – a beautifully elegant City venue (housed in one of London’s last remaining tea warehouses) with a reasonably priced (for the area) menu focusing on “authentic, traditional favourites as well as creative, Asian fusion dishes all made with the freshest ingredients and an eye toward light, healthy eating”. Their words, not mine – and to some extent, those words are true. The menu is a mix of what British curry-eaters will consider traditional curry house staples – Chicken Tikka, Gosht’s, Lal Maas, Sag Paneer, Onion Bhajee’s etc – and more exotic-sounding creations: Bazaar-E-Sabzi, Haash Madhurai, and an impressive range of seafood dishes. The ingredients tasted fresh too, and insofar as nothing we ate was thick and stodgy the eye toward light and healthy(-ish) eating seems to be accurate. So what did we eat? Well, to start we did as we always do – a couple of popadoms and a selection of chutneys. Nothing to complain about – and, to be fair, the chutneys were a far cry from the watered down monstrosities that are often served up. 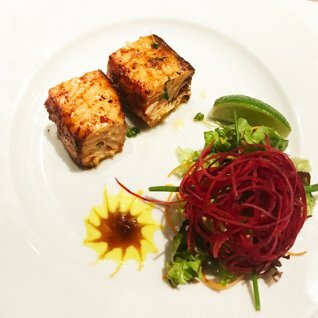 Next came the ‘official’ starters – cubes of Salmon Tikka so delicately spiced and seasoned so as to render the Tikka aspect almost null and void, and inoffensive potato and spinach Pakora. So far, so ‘OK’. And next, the smörgåsbord of mains and sides we’d ordered to explore the depth of the menu. A note here to say that our waiter was unimpressed when we tried to order a Karahi Paneer – an Anokha Speciality which, he suggested, we could get anywhere else. Instead, we were recommended the Bazaar-E-Sabzi as our vegetarian main – described on the menu as an “authentic dish of fresh market vegetables cooked in coconut milk and tempered with delicate South Indian spice”, but which arrived looking (and tasting) more like an East-Asian stir-fry – the coconut milk was nowhere to be seen. 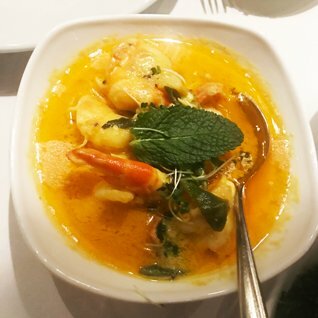 A dish of juicy, succulent prawns – Jhinga Malabar – was much better, meaty pink prawns cooked with mustard seeds, green chillies, curry leaves and coconut cream. Sides were hit and miss: our rice dishes tasted overwhelmingly of ghee and little else, and the Sag Bhajee and Mixed Vegetable Curry were unremarkable. Not bland, but not taste explosions either. The Bhindi Bhajee were good though, a tad on the greasy side but tangy and moreish. Good nan’s too – crispy in the right places, soft and chewy elsewhere, and ideal for mopping up the last of the Malabar sauce. Warnings about the boringness of our vegetarian choice aside, the service was attentive and friendly, and the atmosphere in Anokha is the real star – it feels like a place where people are having a good time, but at the same time there tables tucked into quieter corners so you don’t feel like you’re eating in the middle of a melee. All in all, Anokha is the epitome of ‘not bad’. It really isn’t bad, but it could just be a lot better. For the City location – a short walk from Aldgate and Fenchurch Street – the prices aren’t bad, and some of the dishes on the menu definitely hit the sweet spot. It’s just not consistent, and for a restaurant claiming at least a partial focus on traditional Indian cuisine, more attention needs to be given to making the vegetable dishes truly sing rather than taking up space on the table.